Sometimes a card is likely to speak to you particularly strongly because it so accurately describes your current situation. So, what happens when we actually take the most relevant cards out of the running and allow ourselves to only select cards that could offer a totally different perspective? One spread idea I've formulated involves using your own knowledge of the deck to pinpoint the best cards to express yourself and define your issue before then allowing the hand of fate to step in and clarify the problem for you. Follow these simple steps and see if it helps. - Firstly, focus on a situation that's bothering you at the moment. Maybe it's work or love related. Maybe it's a spiritual crisis. Perhaps you're worried about a friendship or have concerns regarding your child. Think deeply about your own reaction to this problem and what your opinions and feelings are. - Go through your deck slowly and pick out one to five cards that most accurately define the problem and your feelings. For example, worries about a huge debt might urge you to pick out the King of Pentacles or worries about a friend with an unhealthy substance addiction might cause you to select The Devil. - Once you've chosen the cards that best define and describe the issue, shuffle the deck and place one to five random draws beneath your picks. What do these random cards bring to the table? In what ways do they differ from the cards you consciously chose? Do they ask you to face an uncomfortable truth or tell you that your thoughts and feelings require closer inspection? Conscious picks give you the chance to express yourself and confirm your own feelings. Then, random picks are added to flesh out the structure and get you thinking outside the box. Now, try something which will require all of your working knowledge of the deck. Go through it and select cards to tell the complete story of your life. Use it to outline the majorly significant people and events that have shaped and changed you over time. Once you've got a decent amount of cards laid out that create a portrait of your life, place random draws on top of each card to bring a different point of view to the issues raised. How do these random picks match up to the cards you consciously chose to represent these times? Which messages are new to you and how do they make you think differently about your past? 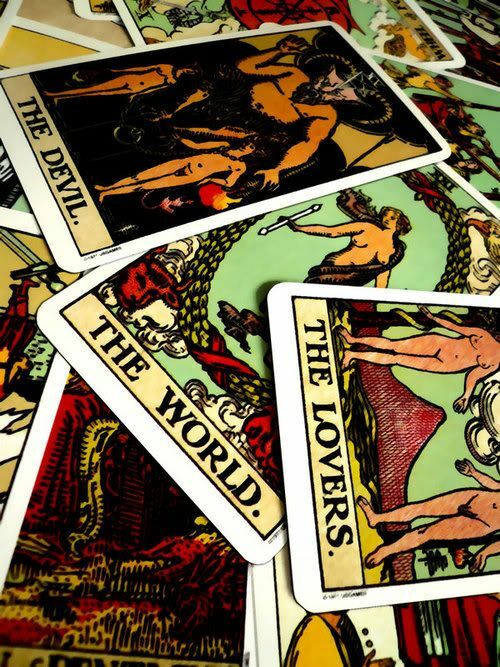 In almost every case, the use of Tarot is based on the blind draw. We shuffle the cards, cut the deck, turn the cards over with no knowledge of what they're going to be.. This is obviously an important practice and it's integral to the way we use the deck, but allowing ourselves to first select the cards that speak to us means that the random draws we work on afterwards are even more surprising and informative at times. If you're reading for a querent you can still use this technique. Allow the querent to explain the issue they're having difficulty with or describe their character to you. As they are doing so, draw cards to represent what you're being told. Talk the querent through the selections you've made, explaining why the cards are relevant and how they accurately represent the information you've been given. Then let the random draws do their work and see where the reading takes you.